The instrumentation can use breakpoint functionality to get better line coverage on builds with debug information enabled. Previous sessions can be automatically merged into new sessions. The default colour scheme has been toned down. The flashing that happened when you resized the source window has gone. 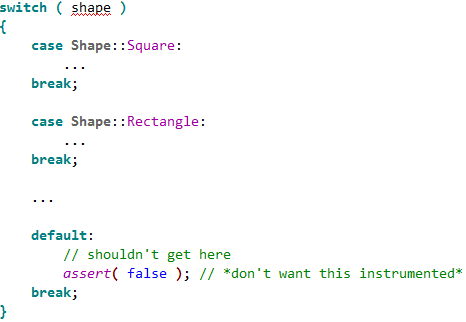 It is now possible to mark sections of code not to be instrumented. I haven’t had time to try this yet, as it was only introduced in v3.0.4. But it should be very useful as currently I have a lot of defensive code that should never be reached (see below). Instrumenting this code skews the coverage stats and makes it harder to spot lines that should have been executed, but weren’t. I had problems trying to instrument release versions of my code. It still fails to instrument some lines (but not many). I had a couple of crashes during testing that don’t seem to have been caused by my software (although I can’t prove that). But the technical support has been very responsive and new versions are released fairly frequently. Overall version 3 is a major improvement to a very useful tool. Certainly it helped me find a few bugs during the testing of version 4 of Perfect Table Plan on Windows. I just wish there was something comparable for MacOSX. This entry was posted in C++, productivity, QA, reviews, software, tools, Windows and tagged code coverage, coverage validator, line coverage, path coverage, software verification, testing, Windows on 3 November 2008 by Andy Brice. The sink is full of washing, I am wearing odd socks and I haven’t been out of the house in days. It must be time to put out that new release. But how can I be sure my testing hasn’t missed a hideously embarrassing bug? Maybe I introduced a major bug when I made that ‘cosmetic’ change at 2am? In an ideal world I would just run a comprehensive automated regression test suite. Unfortunately it is difficult to automate graphical user interface (GUI) testing and the majority of lines of code in most applications are GUI. I estimate that the code for my own table planner software is at least 75% GUI code (not including generated code, which would push it even higher). So I try to manually execute every line of my application before I release it. If I have to make any changes to the code, I start over again. This is very dull, but at least I have a tool to help me: Coverage Validator. Coverage Validator instruments code and shows, in real time, which lines have been executed. Click a few buttons on your application and watch the executed lines of code change colour from pink to yellow. Execute every line in the file and all the lines change colour to cyan. No recompilation or relinking is required and it doesn’t slow down the tested application too much. This real-time feedback is incredibly powerful for testing. The usability isn’t great. There is a confusing plethora of options for instrumenting your code that I would rather not have to know about. It isn’t able to ‘hook’ (instrument) all the lines of code. Whole blocks get missed out for reasons I don’t fully understand. Single line branches are particularly likely to be missed. The GUI isn’t great. For example, the display flashes horribly if you resize it. The automatic results merging is just plain weird. At the end of a session it can merge your coverage results into a previous session. This information isn’t much use to me at the end of a session. I want to merge previous results at the start of a session so I know which lines I haven’t tested. The GUI is quite ugly. They really need to update those tired old icons. However being able to see line coverage information in real time is just so incredibly useful that I am prepared to put up with the many shortcomings. I just run my application alongside Coverage Validator and, file-by-file and function-by-function, I try to turn the lines of code yellow (or, better still, cyan). Every time I have used Coverage Validator I have found at least one potentially embarrassing bug that I hadn’t discovered by any other means. The support has also been responsive. It is just a pity about the flaws, without them this would be a ‘killer app’ for testing. Coverage Validator works with C++, Delphi and VB on Windows NT4, 2000, 2003 and XP. A single licence costs $199. A free 30-day evaluation licence is available. I am using it on Vista currently, and it seems to work fine. This entry was posted in C++, productivity, QA, reviews, software, tools, Windows and tagged C++, code coverage, coverage validator, line coverage, path coverage, software verification, testing, Windows on 10 March 2008 by Andy Brice.